For many years I considered zippers and knitting like beings from different planets. And in most cases I still think those two shouldn't be combined. But since I have softened on this issue: Zippers ARE very handy. But what a hassle to insert them. My, my. 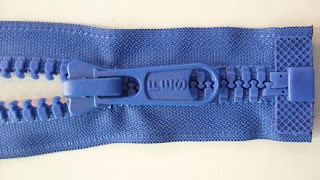 You need large amounts of "Fingerspitzengefühl" and it often seems that you can only tackle it using magic to not end end up with a wavy zipper, a too tight zipper, or a zipper where right and left side aren't matching. Once I was battling with an unwilling project I took to the "Readers Digest Knitters Handbook" better known as "The Montse Stanley" for advice, and the instructions started with a simple sentence that seemed to come right out of my heart, and made me laugh at the same time. It said: Try to avoid zippers. But: Finally there is hope! Somebody came up with a genious approach. With this simple method it even becomes possible to knit in a zipper. Watch this Knit in you zipper tutorial! Personally - I can't wait to try! ja, dat dacht ik ook!! eigentlich guck ich ja alles an, was knitting daily mir so liefert, aber diese Post hab ich fuer nicht wichtig befunden. Ein fataler Fehler. Gut, dass es Dich gibt. Die Idee ist wirklich durchfuehrbar. Tolle Sache.